The official terminology for the implants that are used temporarily for moving teeth (in orthodontics) is Orthodontic Temporary Anchorage Devices (TADs). These special implants (designed for orthodontists) are also called by various names: Orthodontic Implants (OIs), Mini Screw Implants (MSIs), Mini Dental Implants (MDIs), or simply a "pin." Figs. 1-7 are used with the intention of showing a case that requires a TAD. Not all orthodontic cases need TADs. The upper midline is coincident with the facial midline (not shown), but the lower midline is shifted to the patient's left about 4 mm. 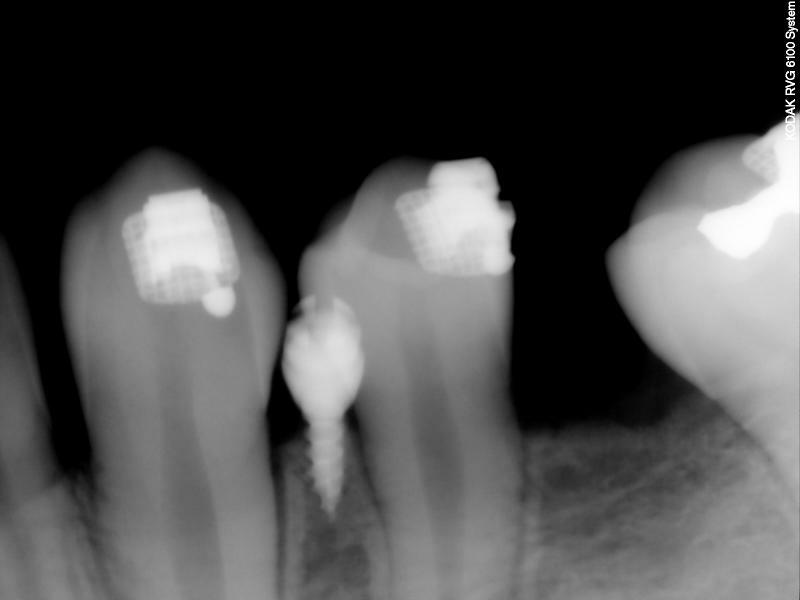 The lower left deciduous second molar (LLE) was ankylosed with hypo alveolar crest (radiograph not shown). 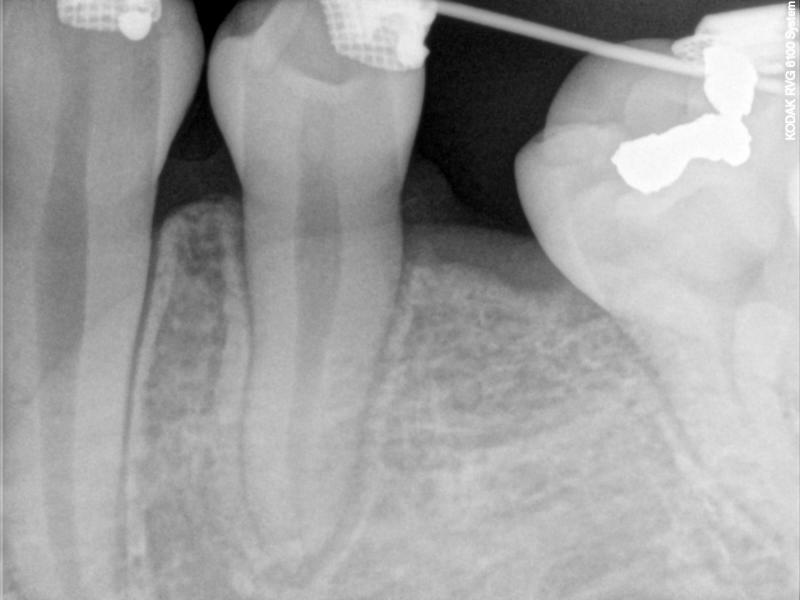 The treatment plan was to extract LLE, then protract the lower left 1st molar (LL6) to close the gap of missing LLE, and to shift the lower midline to the patient's right (to match the upper midline). It would be impossible to achieve these treatment objectives with traditional technique (w/o a TAD). Fig. 1. The lower midline is shifted to the patient's left. Fig. 2. The LLE is ankylosed. It can be seen that Figure 6 shows immediate loading with light activation which is necessary for bone modeling. The TAD is used as an absolute anchorage to protract LL6 without side effect. (The lower left canine will be moved forward later to achieve Class I canines.) An alternative mechanics may be used with a power arm to achieve a slightly more horizontal force but a bit complicated and less comfort (for the patient). The advantages of using TADs are that they are designed specifically for orthodontists. TADs are placed temporarily, and they will reduce treatment time. A specially formulated topical anesthetics is first applied, then a TAD is placed into the bone. The patient feel no pain. The reason is the bone itself has no nerve. Unwanted side effects are often inherent with traditional technique. To avoid these side effects, TADs are used to provide absolute anchorage for orthodontic movement that is difficult or impossible to achieve with traditional technique. TADs do not involve invasive surgery so patient discomfort is limited. However, after a TAD is placed, some healing time is needed (less than an extraction). Choosing the best location for TADs requires careful consideration of the biomechanics that will be used and the teeth-and-bone conditions. TADs are different than the (regular) dental implants. They are different in both design and application. Dentists, including periodontists and oral surgeons, who may have a lot of experience in dental implants but have no knowledge of TADs and want to place a TAD could do more harm than good. A TAD with proper design is the one with self-tapping or self-drilling device. It is a drill-free screw whose apex is sharp and tapered to allow placement without a pilot hole. The thread design is also important for ease of placement and long-term success. It has been shown that drill-free screws have better bone-to-implant adaptation than dental implants that require pre-drilled pilot holes. Typical dental implants are 3.75-mm in diameter whereas TADs are smaller in diameter. Depending on the manufacturers and applications, the required diameter and length of TADs vary. For example, RMO TADs have different diameters (1.4 mm, 1.6 mm, and 1.8 mm) and lengths (6 mm, 8 mm, and 10 mm). Dentaurum TADs have only one diameter (1.6 mm) and different lengths (6mm, 8 mm, and 10 mm). IMTEC implants have only one diameter (1.8 mm) and different lengths (6mm, 8 mm, and 10 mm). The length of TAD is not critical as long as primary stability is achieved (cortical bone must be fully threaded).